Incentivise customers with irresitible offers that boost your checkout rate by 25%+. 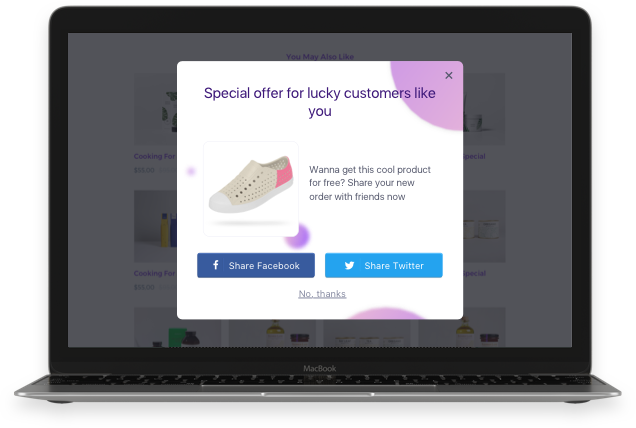 Motivate your customers to finish checkout by showing them an offer in exchange for a social share on Facebook or Twitter about their order with you. The reward could be a discount code, a free shipping coupon, or a free gift. Posts and tweets shared by your customers on their social profiles will bring social referral traffic to your brand. More shares mean more new customers and more sales! Do you know that 68% of online shoppers abandon their carts right before checkout? 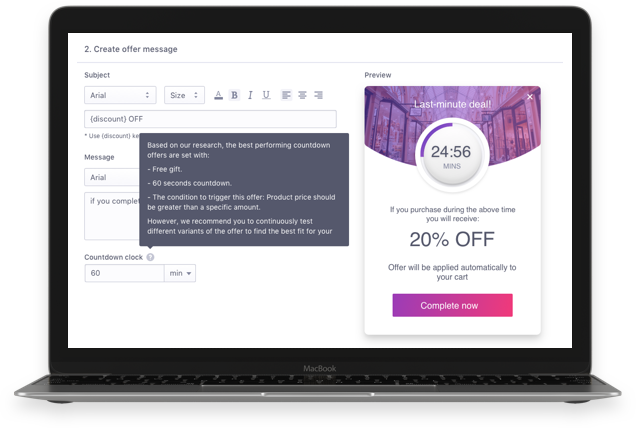 Entice leaving customers with powerful exit-intent offers that convince them to stay and complete checkout. Checkout Boost tracks every visitor's mouse movement and displays offers right before they leave your store, to help you turn leaving customers into buyers. 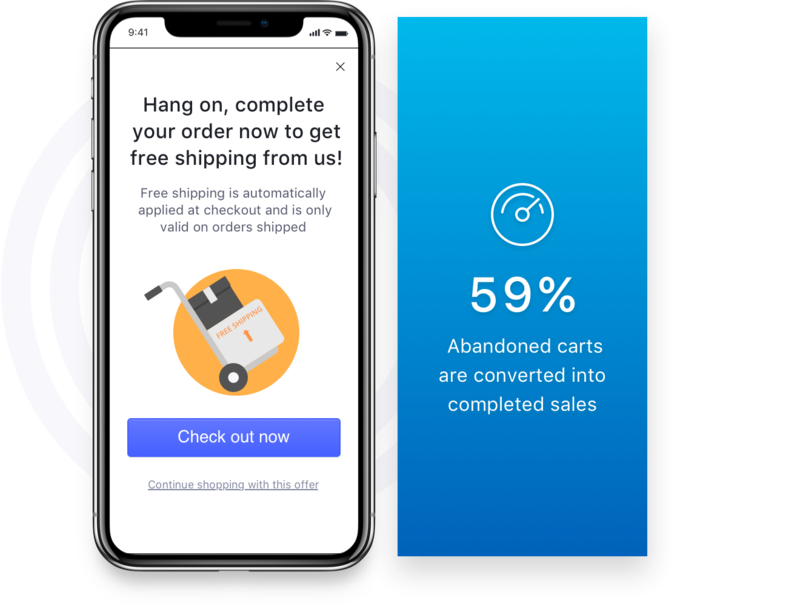 Checkout Boost supports any type of incentives that highly entice online shoppers, from discount codes, free shipping, free gifts, to BOGO offers. We make sure you'll lose no potential customers no matter what devices they use, by displaying your offers nicely on desktop, tablet, or mobile. You can freely design offer themes that match your store's look & feel and attract customers with eye-catchy popups. We provide detailed report on every offer so you can keep track of offers that work for your niches and optimize them for better performance. "Checkout Boost is truly amazing. It took less than a minute to set up. We got results on the very first day. Several customers published the product in their cart on Facebook, but more importantly they bought product! Over the first couple of weeks our incoming Facebook traffic doubled, we have never had this much Facebook traffic. Facebook likes for our store went up 20% and checkouts have gone from an average of 2% of traffic to 5%. I am in shock!" "HIGHLY RECOMMEND! Fast install, streamlined dashboard, very easy to quickly create an offer, and I received 4 Facebook shares within the first 2 hours! Customer service (Quan) is very helpful and super responsive. 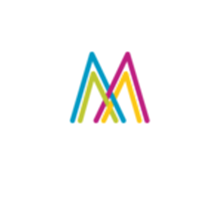 Love this app and so thankful for the service and value it provides my website and customers." "Recently installed and am excited to start using it. This will go well with ad campaigns we will run where we offer a free product with a purchase. I can also see it increasing our checkout rate and creating goodwill with customers." 15-day free trial. Cancel anytime. No risk.